In the midst of all the new UCI regulations the one that is catching most attention is the lawyer tabs. These are the groves molded into almost front fork on a bicycle to prevent a wheel from coming off the bike should the skewer come loose. Professional teams file these off to make wheel changes during races quicker to save precious seconds. As far as safety there has never been an incident where a wheel has come loose and caused a crash. The ironic thing is that the technically of the rule actually prohibits modification of equipment. Manufacturers could make factory forks without the tabs and the bike will then be legal because it hasn't been modified. I think this rule is a bit wacky. It doesn't appear to be here for the rider’s safety, because if it was then they would require the tabs. It's another bureaucracy and example of how far the UCI officials have removed themselves from the love and care of the sport. Now for safety reasons should the tabs be required? Well from what history shows it seems it hasn't been an issue or caused unsafe riding conditions. For consumer use I recommend leaving these tabs intact. I'd hate to hear of someone happening to have a crash in the theoretical possibility of a skewer coming loose. Filing the tabs off also voids your warranty so that's another good incentive. 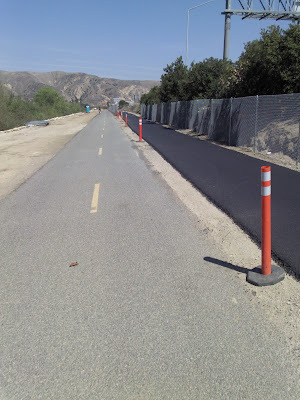 Last week I rode out to Corona via the Santa Ana River Trail. 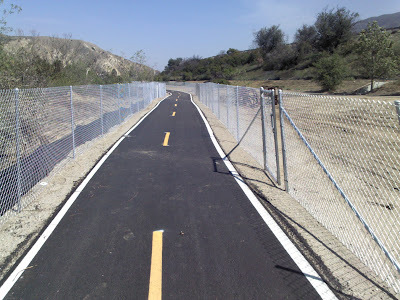 As I passed through Canyon RV Park and past the section of the elevated freeway I saw a new section of bicycle path pavement between the existing path and the freeway, which then cut across the existing bicycle path and took a wider loop away from the freeway and up the little hill by the old Coal Canyon off ramp. It’s nice to see new smooth pavement on the trail and continued attention to it. As of now the new sections is newly constructed and not open to bicycle traffic yet. Team owner Phil Southerland believes invitation was dependent on Sponsorship. 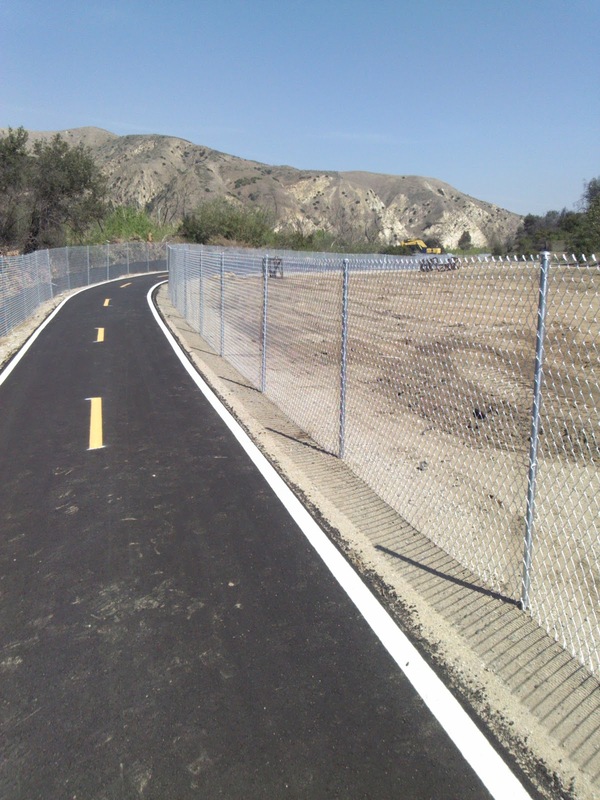 Earlier this week AEG announced the teams for the 2012 Tour of California bicycle stage race. Team Type 1 was not that list this year. The race organizers claim that they want to keep the field fresh and rotate through different teams each year instead of invited the same teams every year. While this is understandable it is very disappointing to see a quickly improving American, Pro Continental team from the race. AEG approached Team Type 1-Sanofi with an option of a $100,000 sponsorship package from sponsor Sanofi, which Team Type 1-Sanofi declined. In 2009 the team raced free of charge. 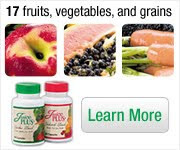 In 2010 they paid $40,000 which their sprouting sponsor agreed to. Then in 2011 Phil Southerland demanded the team be invited and won his demand. The team will fill their schedule with other races in France and tour of Norway and hopes to be invited to the USA Pro Cycling Challenge in Colorado. 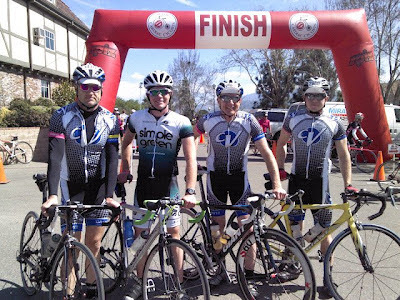 It was the day before the annual Solvang Century 100 mile bicycle ride. I’ve done this ride since 2006 and it has become a ritualistic event. Ed, Danny and I carpooled. As we drove through the early Friday afternoon, we listened to Ed's oldie music: America, the Beatles, and Beach Boys. We had our only mechanic problem of the whole trip. My front wheel which was on the roof rack came off the rack, but held in place by a cable that Ed wisely ran through the bikes and wheels from prior experience, but amazingly my skewer came completely off and was lost! Fortunately Ed had a spare in his tool kit. We got to the hotel at about 3:30 pm and relaxed until dinner. We meet our teammate Paul for dinner at the World Famous Anderson’s split pea Soup. As we chatted we debated how this restaurant became world famous for its pea soup. Was it self-proclaimed or and awarded title? We went to ride check in at shortly after 6 pm, which was a mistake. The line was the longest I've seen in years! It took about 45 minutes! Then we went back to the hotel for an early night so that we would have plenty of sleep for the next day. On Saturday morning we woke up at 6:15 and put our kits and numbers on. I was eager to get down to the breakfast lounge for some coffee and Danish pastries which are baked fresh every morning in Solvang. It was a chilly morning, about 45* and so I put on knee warmers, a wind vest, arm warmers, and long finger gloves. At 7am Paul, Ed, Danny and I met Jose, another Canyon Velo rider in our parking lot at the Anderson's hotel in Buellton and then we rode into Solvang to meet with the rest of our group at the Svendsgaard lodge and then rode down the street to the official start. We left the start line at 7:38 am, with about 8 Canyon Velo riders and 2 Cycles Veloce. We started off with a pace a little faster than moderate. There were already hundreds of riders on the course. The organizers had let riders off as early as 6:30 am! We were constantly passing riders on their left. Shortly after we got on Santa Rosa Road, a mixed group of riders from La Habra Cyclery/Chronic Tacos, Spy+/Blue bike team and various other riders came by us. We got in the peloton and rode along, averaging about 25 MPH on Santa Rosa road which has numerous long rolling hills, our pace through Lompoc was relaxed and even a bit strung out from the point when we passed the food stop until a few miles later. As we got back on highway 1 we made good use of our pace line since the wind picked up and we had hills to climb. As we turned east from Vandenberg air force base the pace got faster, more serious, and competitive. On the last long grade which is a category 4 climb on highway 1 before getting onto road 135 which goes into Santa Maria, Mark, Paul and I were at the front of the pack taking long, strong pulls. Several miles later when we took a break from the rotation, a couple of hot heads from La Habra Cyclery started talking smack, complaining that we weren’t doing our share of pulling. We reminded them of our pulls up the grade and that we hadn’t seen them up front with us. And if we we're so weak, why don't they just drop us? Yep, that's a sample of what the pro peleton is like; meaningless trash talk. Everybody stopped at the 55 mile food stop and waited for Ed who narrowly avoided a crash that happened right in front of him and Danny to catch up who had gotten dropped after Vandenberg on a climb. We decided not to rejoin with the group we had been riding with on the first 55 miles. With the 5 of us ready we took off together for about 5 miles. Then a group of riders who were a part of a Carmichael training camp passed us and we joined. The pace was a little too hard for Danny, and so he, Ed and Paul dropped back and finished together at their pace. Mark and I stuck with the CTS group the rest of the ride. Their group was led by a very strong Cat 1 rider who gave us the pull almost the entire way. It was wonderful to be cruising along Foxen Canyon road at 23-25 MPH instead of 18. We took a fairly tough pace up the first of three climbs on Foxen Canyon road considering we were fairly tired from the ride already. After that it was mostly downhill to the end, with just two more short, step hills in between. It was a very pleasant ride with the CTS guys and we appreciated their help. If we knew their names we'd be sending them thank you cards; a big shout out goes to them. Okay, so the finale! Mark and I finished at 12:30 pm, averaging 22.1 MPH. Our total ride time was 4:52 with stops, and 4:31 moving time. It's our best time, and it was a huge accomplishment. Danny finished his first Solvang Century with a moving time of about 4:53. Fantastic job Danny! After the finished the ride we noodled back into Buellton for lunch. The Solvang Century trip is not complete without the annual trip to Gino’s Pizza. We had our delicious slices and reminisced about the ride and how everyone had done. We went back to the hotel and enjoyed the Jacuzzi. It felt good to relax and let the muscles recoup. Once again, we had an early dinner. Ed wanted Mexican food and we were all up for that. I remembered this good place in Lompoc called Café San Martin. We drove the 20 miles for it. We all had cheese enchiladas. It was worth the drive and we recommend the restaurant. We went to bed early since we had to leave at 5:30 the next morning for other engagements. I had the pleasure of sleeping through most of the early morning drive. We all enjoyed the ride and look forward to next year!